This Hampton Inn is less than 10 minutes from the Hays city center and features a heated indoor pool and whirlpool. Free Wi-Fi is available throughout the hotel. Rooms at the Hampton Inn Hays-North of I-70 offer cable TV with free premium channels and pay-per view movie options. An in-room coffee maker, work desk and ironing facilities are included. A buffet breakfast is served each morning at the Hampton Inn. A bagged breakfast is offered to guests who have less time and snacks may be purchased at the on-site Suite Shop. Guests can get active at the on-site fitness center or complete work at the business center, with a public computer, printing and fax services. The Hays Hampton Inn is 13 minutes from both Fort Hays State University and Frontier Historical Park. 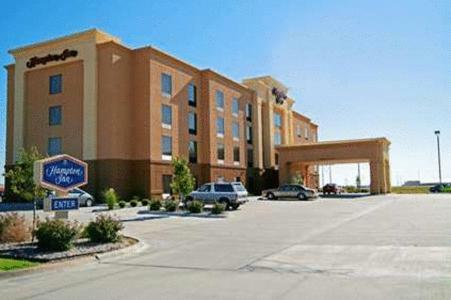 the hotel Hampton Inn Hays-North of I-70 so we can give you detailed rates for the rooms in the desired period.